One of the smaller joints in the body, the wrist is a complex joint that bridges the hand to the forearm and is actually a collection of multiple bones and joints. 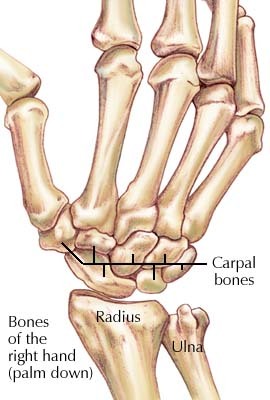 The bones comprising the wrist include the distal ends of the radius and ulna, 8 carpal bones. All of these bones participate in complex articulations that allow variable mobility of the hand. In order to maintain mobility without sacrificing stability, the wrist joint has a complex configuration of ligaments. Forward bending or flexion is needed for daily activities such as styling your hair, writing, getting dressed, using a screwdriver and lifting heavy objects. Extension or backward bending of your wrist is necessary for opening your car door, pushing a door closed, pressing up on the arms of a chair and driving. Ulnar deviation tilts your wrist toward the pinkie side of your hand and Radial deviation tilts your wrist toward the thumb side of your hand. These movements are used frequently during the day as you type, write, get dressed and talk on the phone. The carpal tunnel is a narrow passageway in the wrist formed by small carpal bones and connective tissue called the transverse carpal ligament. Because these boundaries are very rigid, the carpal tunnel has little capacity to "stretch" or increase in size. The median nerve, the main nerve of hand passes through the carpal tunnel at the wrist. The tendons that flex the fingers and thumb also travel through the carpal tunnel. Carpal tunnel syndrome occurs when the tunnel becomes narrowed or when synovial tissue surrounding the flexor tendons swells, putting pressure on the median nerve.